About the blog | Fire on the River! I thought I would kick off this blog (or “blawg,” as they are dubbed in legal circles) by explaining the title I have selected: “Fire on the River.” For the last few years I have been writing for the Minnesota State Bar Association’s monthly magazine, Bench & Bar, contributing brief updates on legal issues related to the environment, energy, and natural resources. This has been a useful pursuit—it is good to stay abreast of significant developments in environmental law when you are an environmental attorney! But it has also been fascinating. Consider that every change to environmental laws, however small, represents the formalization of some public policy regarding the environment, arrived at after much debate and input from citizens, politicians, regulators and others. Tracking these changes is like having a front-row seat to evolving story of the relationship between us, humans, and the pretty blue planet we call Earth. Pretty interesting stuff, especially in light of the unprecedented environmental challenges we face, not the least of which are climate change and depletion of natural resources. And, of course, incremental changes in the law can have enormous real-world implications: a stricter EPA air quality standard that will prevent hundreds of respiratory-related deaths each year; a court decision expanding the scope of the Clean Water Act that will increase the cost of a new copper mine by millions of dollars. But back to the blog title. My search for a name began with several hours of Google-ing and Go-Daddy-ing such candidates as “envirolawblog.com,” “environmentalpolicy.net,” “environmentallawupdate.mn,” and “doyouneedanenvironmentallawattorneyifsocallme.org.” However, these had either all been used or were pathetically uninspiring. 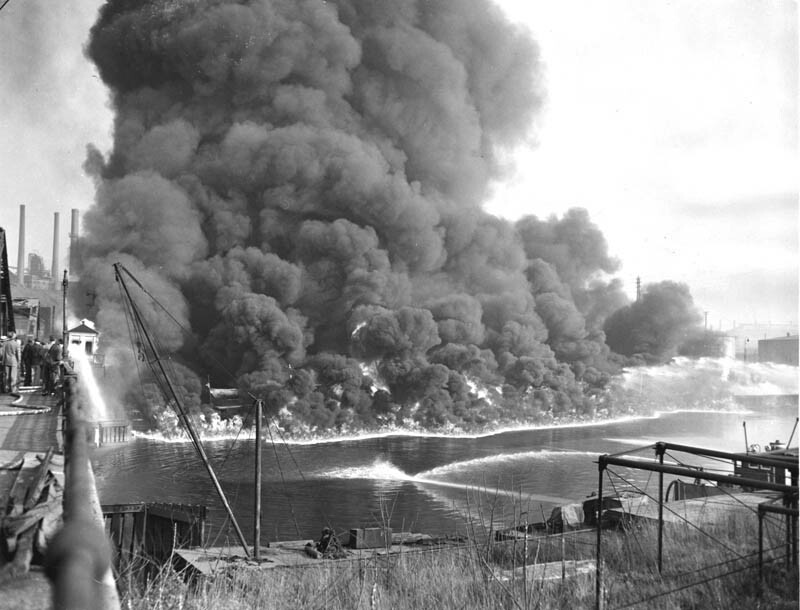 It was then I recalled a remarkable story I first heard in my introductory environmental law class at law school: that of Cleveland’s Cuyahoga River, which, in 1969, was so impossibly polluted that it spontaneously erupted in flames. An indelible and instantly understood image that inspired a generation of environmentalists. An unmistakable warning, straight from the Book of Revelation. It seemed to me the perfect title for this blog. Let me explain. The Cuyahoga River fire occurred on June 22, 1969. Richard Nixon was six months into his presidency, the Viet Nam war raged, Bobby Kennedy and Martin Luther King Jr. had been assassinated the previous year, and in 7 weeks, half a million young people would show up for a music festival in Woodstock, NY. (And, for what it’s worth, I was running around in diapers on the beaches of San Diego.) Just before noon on the 22nd, an oil slick and assorted debris caught fire beneath a railroad trestle on the Cuyahoga River, likely ignited by sparks from a passing train. [i] Decades of unrestricted dumping of waste into the river by refineries and other industries had left the Cuyahoga clotted with oil and other combustible pollutants. A Time magazine article published shortly after the fire described the Cuyahoga as “Some river! Chocolate-brown, oily, bubbling with subsurface gases, it oozes rather than flows.”[ii] The Timearticle published the iconic photo reproduced above, and the image, and story, captured national attention. Were it not for the Time article, however, the fire might have gone largely unnoticed. In fact, the Cuyahoga had caught fire numerous times over the preceding century, and by contrast with these earlier fires, the 1969 blaze was relatively minor, causing only $50,000 damage and extinguished within a half hour. A 1912 fire on the Cuyahoga had killed five dock workers, and one in 1952 caused $1.5 million in damage when it spread to adjacent shipyards. [iii] Similar fires had also occurred on many other American rivers during this era of rapid industrial growth, but they were generally viewed as simply a nuisance, a hindrance to navigation, an unfortunate side effect of industrial production and growth. Tellingly, Cleveland’s fire chief in 1969 described the burning Cuyahoga as a “run of the mill fire,”[iv] and the limited coverage of the fire by local newspapers focused on damage to the trestle, not the river. [v] Preventing water pollution, as an independent goal, was simply not a priority. Indeed, the Cuyahoga River fire marked a fundamental shift in environmental law and policy in this country, particularly with respect to water pollution. Existing U.S. laws regarding the nation’s waters were almost exclusively targeted at promoting water transportation and commerce, not water quality. The Rivers and Harbors Act of 1899 (“RHA”) prohibited the discharge, without a permit, of “refuse” into waters. However, the prohibition only applied to waters that were literally “navigable” (excluding, for instance, most wetlands). And early judicial interpretations took a strict interpretation of “refuse,” finding, for example, that fuel oil accidentally discharged into the Mississippi from a steamship was not “refuse” within the meaning of the Act because the fuel was “completely sound, valuable, and usable material, in no way damaged or impaired in value.”[ix] Another RHA case, Wyandotte Transportation Co. v. U.S.,[x] involved two barges that sunk in the Mississippi after colliding with a supertanker in Louisiana. The central issue in the case was who should “be declared responsible for removing the impediment to navigation thus created.” The fact that one of the sunken barges contained 2,200,000 pounds of liquid chlorine was mentioned merely in passing (although the Court optimistically noted that the government had begun “a study of the danger posed by such a substantial load of chlorine at the bottom of the Mississippi”). Although the CWA’s goal of ending water pollution by 1985 remains unrealized, the Act’s comprehensive approach to limiting water pollution has nonetheless wrought major improvements to the quality of our waters. Perhaps the best illustration of these improvements is the Cuyahoga River itself, which, 40 years after the famous fire, has literally come back to life. In 1969, the Lower Cuyahoga River had “no visible life, not even low forms such as leeches and sludge worms that usually thrive on wastes.”[xv] Today, the water quality is so improved that beavers, blue herons and bald eagles nest along the river’s banks and the Cuyahoga is home to more than 60 species of fish. [xvi] That’s something to celebrate. During this same era, Congress also passed many of the other major federal environmental statutes, including the National Environmental Policy Act (1970), major amendments to the Clean Air Act (1970), the Resource Recovery and Conservation Act (1976), the Toxic Substances and Control Act (1976), and Superfund (1980), and so doing laid the legal foundation for the modern era of environmental law. The Cuyahoga fire stands as a milestone in environmental law, an unforgettable event that mobilized in new generation of environmentalists and ushered in a brand new set of environmental laws. We have spent the last 40 years working out the details and meaning of those laws, balancing their lofty goals with their real-world implications. The posts on this blog will reflect that ongoing process. The Cuyahoga fire also stands as a cautionary tale. The 1969 Time article was titled “America’s Sewage System and the Price of Optimism,” presumably referring to the environmental cost of a century’s worth of unbridled industrial growth. Looking back on the Cuyahoga fire, it is hard not to consider parallels to today. Will we have a Cuyahoga fire of this generation? An event that awakens us to the environmental price of our own optimism? The Pacific finally swallowing some tropical Island? The Ogallala Aquifer drying up? If and when such an event does occur, rest assured that the resultant call to action will be promptly reflected in environmental laws. So for all these reasons, “Fire on the River” seemed like a great title for this blog. On a personal note, as an attorney who also happens to be an avid fiddler player (see http://www.sweetcolleens.com), I also like that fact that “Fire on the River” would make a fantastic name for a fiddle tune. And it doesn’t hurt that the phrase evokes a classic line from a certain song by Charlie Daniels. And so with that, let the fun begin. I welcome your comments, encouragements, criticisms, insights, and anything else you care to contribute. If you know anyone who would enjoy this blog, please spread the word. Thanks! [i] Christopher Maag, From the Ashes of ’69, a River Reborn, N.Y. Times, June 21, 2009. [ii] America’s Sewage System and the Price of Optimism, N.Y. Times, August 1, 1969. [iii] Michael Scott, Cuyahoga River Fire Galvanized Clean water and the Environment as a Public Issue, The Plain Dealer, April 12, 2009. [iv] Tony Long, Umm, the Cuyahoga River’s on Fire… Again, Wired.com (June 22, 2011, 7:00 am), http://www.wired.com/thisdayintech/2011/06/0622cleveland-cuyahoga-river-fire-burns-again. [v] Scott supra note iii. [ix] U.S. v. The DeValle, 45 F.Supp. 746, 747 (E.D. La. 1942). [x] 389 U.S. 191 (1967). [xi] 33 U.S.C. § 1251 et. seq. [xiii] 33 U.S.C. § 1362(7). [xiv] 531 U.S. 159, 179 (2001) (quotations omitted). [xv] America’s Sewage System and the Price of Optimism, supra note ii. [xvi] Mag, supra note i. Really liked what you had to say in your post, About the blog | Fire on the River!, thanks for the good read! Had a wonderful time reading this nice article. Keep up the good work. 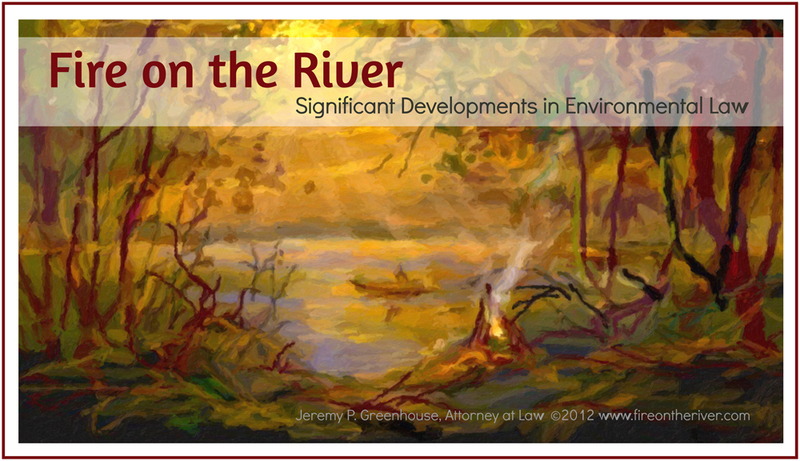 Jeremy P. Greenhouse is a partner at the Minneapolis-based environmental law firm The Environmental Law Group, Ltd. Jeremy is also the founder, editor, and primary author of Fire on the River!